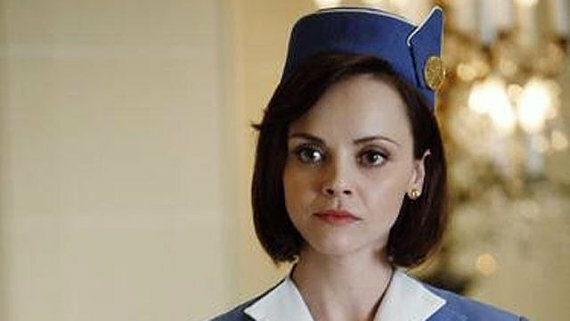 I got an email asking if I could make this hat from the new show on ABC called Pan Am, about the Airline stewardess of the 1960's for the Pan Am company. For those who don't know I also own an Esty shop http://ThreeLace.Etsy.Com which is basically the Ebay of Hand made Art/Crafts/Stuff. Here's a picture of actress Christina Ricci wearing the lovely hat. The Etsy requester provided this image as a reference. On to making the hat. I decided to make it a Pill Box style. I watched the pilot episode and I noticed the back of the hat is curved down like a er um, i dunno, let's just say it's not pill box style. But I think that a Pill Box style is easier to do and still gets the same front look. Like I mentioned before, the front panel is higher than the top of the hat. I also use it to hide the connecting stitches for the rim and the numbers I wrote (whoops it was suppose to be on the inside). Using fabric glue I glued the front panel (even though sewn) so that it stays put and uses the fabric glue also to adhere the diamond to the side. Sure I can do this by hand stitching, but the shortcut gets the same results in less man hours. Going to be at Geek Girl Con!